Going in to the Alabama A&M swing, one would think you wouldn't learn much about the Auburn team. It really shouldn't have posed a challenge (and it didn't) but you still want to learn and get better from every game and I really think Auburn did. How about not allowing an earned run in 2 games? That's pretty good. 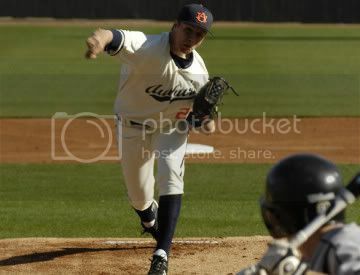 How about getting two outstanding starts by Auburn pitchers? Even better. Not taxing our bullpen? Fantastic. Now, some of it could be the competition and maybe the fact that Alabama A&M had their head coach resign on the team bus and were told by the athletic director (and I'm summarizing) "Hey guys, you're head coach is no longer your coach. You still wanna play this game?". Still, the bulldogs still played and then proceeded to get shelled out of the park by scores of 11-1 and 18-0. We don't really need to delve too deep into the offense. The Tigers were a little sluggish in the early innings, but that's understandable. Spring Break, SWAC opponent, long road trip, yada yada yada. The best thing about Price's outing is how he recovered nicely from his first inning and started really hitting his spots. Also of note, 16 of the 25 Batters that priced face were retired by 4 or fever pitches. Also his control seemed to be spot on; he only got into a full count twice (one time ending in a walk, the other in a strikeout). Still a solid outing from Price and a little nice bailout by Blatt to keep the lead off double from scoring. Alabama A&M’s control issues on the mound made for some elongated late innings, interesting position switches and unusual stat lines. In the seventh inning, for instance, Creede Simpson, who went hitless, took a hit-by-pitch and came all the way around to score on multiple wild pitches. The Bulldogs, who dress just 22 players, swapped out their pitcher for a rightfielder in the seventh and had a reliever come out of the dugout in the eighth. Still, 2 wins are 2 wins and it gets the Tigers prepared for later in the season and gets them ready for UGA on Friday.